As consumers, we are now accustomed to speaking with chatbots during the buying process. When we have a question or concern about a product or service, we can simply open the in-browser chat window and type the query. In just seconds we can be served a relevant and helpful answer – plus additional information which drives us towards the sale. Now, this is in the consumer space. So, what about in the realm of B2B? As the statistics above show, B2B companies can take up to 10 hours to respond to leads and prospects, despite the ideal response time being just 5 minutes. This clearly illustrates a division between companies’ capabilities and customers’ expectations – not good for business. But, this is where chatbots can initially make a positive mark. As an autonomous tool filled with thousands of potential answers and solutions, a chatbot can respond to leads and prospects immediately, on a 24/7 basis. So, while you and your team are tucked up in bed at 4am, a chatbot can be answering questions from potential buyers in other time zones or countries around the world. At the early stages of the buying cycle, prospects can have a range of top-level questions. Most likely focused on product/solution capabilities, these queries must be answered. However, dedicating human resources to this activity can ultimately take employees away from more business-critical tasks. For example, why have a member of the sales team responding to a prospect, when the answer requires no technical knowledge, and the lead may not even go on to convert anyway? Surely, the better use of time and resources would be for chatbots to engage with top-of-the-funnel prospects, while the sales team invest their time in converting more sales-ready leads. Most businesses now have a range of content pieces which help the prospects and leads reach a sales decision. However, much of this content can end up dumped on a company web page, and forgotten by everyone – including the writer. With chatbots however, these content pieces can be factored into answers so that when a prospect asks a question, they can be supplied with or directed to a highly relevant and engaging piece of content. Now, not only is the chatbot engaging the prospect and answering their questions, it’s also promoting company content that may otherwise not have been used in the process. 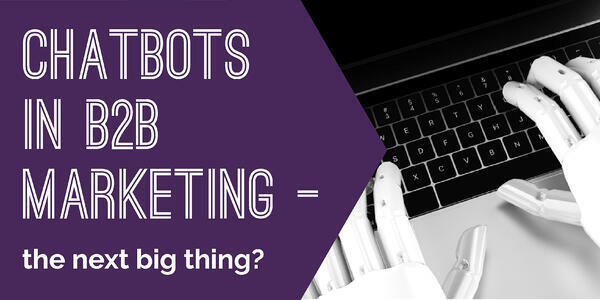 So, in answer to the title of this post, yes chatbots may indeed be the next big thing in B2B marketing. At Really B2B, we have a team of marketing technology experts who are always exploring the latest tech developments to find the ones capable of generating the maximum ROI. If you’d like to hear more about the latest Martech and how this can help your business grow profitably, speak to us today on 02392 314498 or email info@reallyb2b.com.